Triceratops prorsus skeleton, Natural History Museum of Los Angeles County. 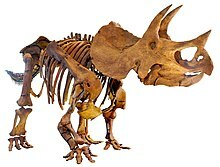 Ceratopsidae (sometimes spelled Ceratopidae) is a family of dinosaurs including Triceratops, Torosaurus, and Styracosaurus. All known species were quadrupedal herbivores from the Upper Cretaceous, mainly of Western North America (though Sinoceratops is known from Asia as well as possible fossils in Japan, and Kazakhstan)[source?] and are characterized by beaks and elaborate horns and frills. The group is divided into two subfamilies (see Taxobox). ↑ Xu, X.; Wang, K.; Zhao, X.; Li, D. (2010). "First ceratopsid dinosaur from China and its biogeographical implications". Chinese Science Bulletin 55: 1631–1635. doi:10.1007/s11434-009-3614-5. This page was last changed on 14 August 2018, at 04:02.